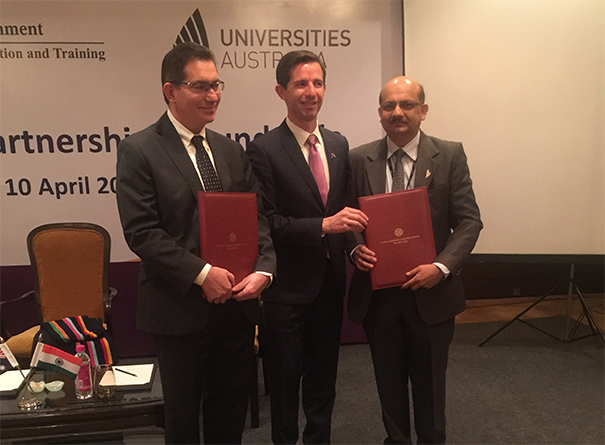 UNSW signed a memorandum of understanding to collaborate on advanced composites manufacturing technologies to support the new ARC Training Centre for Automated Manufacture of Advanced Composites via a new partnership with National Aerospace Laboratories (NAL), a constituent institution of the Council of Scientific and Industrial Research (CSIR) under the Ministry of Science and Technology, Govt. of India. NAL is a premier aerospace research and technology development organization of the country. The MoU is a broad framework for joint research projects between CSIR-NAL and UNSW. The broad range of envisaged activities under this MoU are the development of improved methodologies for composite structure design and analysis, manufacturing, testing and structural health monitoring. The joint research projects will also promote exchange of researchers and students.